Everything I know about Dolph Lundgren from my childhood, I know because of my brother. It was my brother who watched and rewatched action classics like UNIVERSAL SOLDIER and MASTERS OF THE UNIVERSE over and over again. I merely caught whatever was on when I stumbled into the living room out of pure boredom. For years, fans like my brother have been waiting to see a contemporary action star emerge that could blow the crap out of everything without calling in their stunt double to do the real dirty work. I say, why wait for one though when you can have a whole slew of them right now? Thanks to Sylvester Stallone, my brother can quit holding his breath and get in line for THE EXPENDABLES – a film about a band of mercenaries that infiltrate a tiny island to liberate its people from an oppressive dictatorship and destroy everything they possibly can while they’re at it. Throwback premise aside, Stallone, who also wrote and directed the project, has assembled a list of bad boys that would frighten anyone into submission – from Jason Statham and Jet Li to Steve Austin and Randy Couture. And sitting right near the top of this obscenely muscular heap is Captain Ivan Drago himself, Dolph Lundgren. And he’s right. Respect and honour are the reason these misfits have stayed together all this time and also what gives the film some unexpected humanity and realism. Stallone has his convictions; Statham is a loner trying to find something real; and Li is having a hard time making ends meet for his family. Lundgren meanwhile, has found himself caught up in a narcotics addiction that has changed him from a fighting machine to a liability. “In the originally script, he was a user but there was much more obvious evidence,” Lundgren confides. 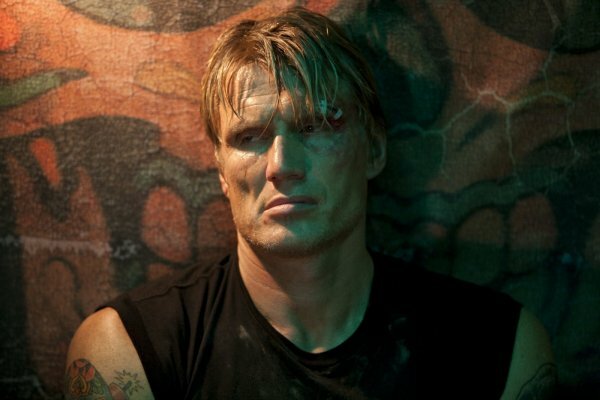 “They make a big deal of it but Stallone cleaned it up and made it more ambiguous.” Lundgren imagined his character, Gunner Jensen, in some sort of a hazy romp with hookers and drugs for days before we meet him on the crew’s first hostage mission, blitzed out of his head with an anti-tank gun in his hands. “People might end up getting hurt,” he quips. The truth of it is, North American audiences haven’t seen much of Lundgren at all recently, let alone different “colours of his palette,” as he puts it. 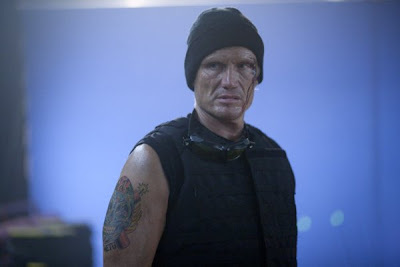 With the buzz for THE EXPENDABLES being almost as loud as the film itself, it would seem that we could all be poised to see a lot more of Lundgren and the guys. THE EXPENDABLES certainly feels like an inevitable hit but it remains to be seen if a bunch of aging action heroes – and I say that with the full knowledge that any one of them could pummel me for doing so – can capture the attention of a generation brought up on action heroes that are a heck of a lot hotter than they are monstrously sized. Well, that and a lot of big stuff getting blown up.